Plant Bugs of many kinds can be found on virtually every kind of seed plant. Plant Bugs belong to the true bug family, Miridae. ‘True Bugs’ because entomologists restrict the term bug to a subset of all insects, whereas the lay public tend to lable all invertibrates as bugs. Many plant bugs have a restricted host range, feeding on just a few select and closely related plants. Other species of plant bugs are more diverse in their selection of food plants. Mirid bugs have specialized, piercing-sucking mouthparts that they insert into plant tissues and then pump plant fluids up through a narrow channel much like a person using a straw. Their feeding tends to be concentrated at the most nutritious parts of the plants namely the developing seeds/fruit. When these aren't available they will feed on new, growing shoots. Mirids have good eye sight and are quick to move if they sense that their movements are being targeted. By this algorithm a camera lens is just as threatening as a bird or lizard. Adult plant bugs have fully developted wings folded over their dorsum and can take flight in an instant when threatened. 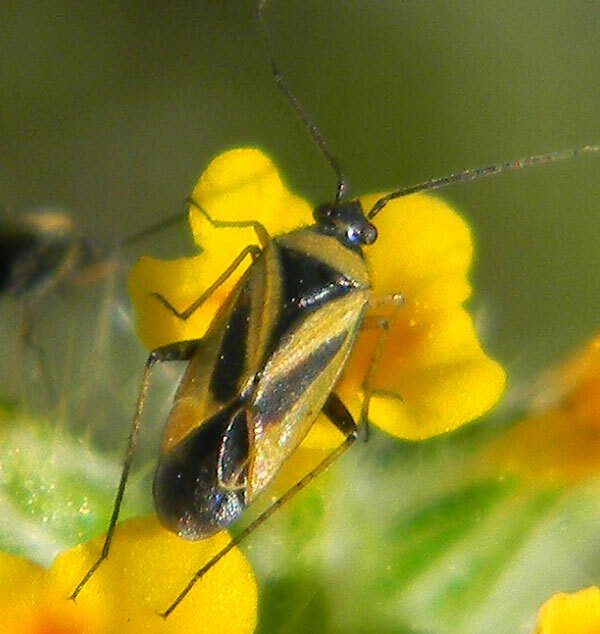 The Orange Fiddleneck Plant Bug also has a color pattern that allows it to hide effectively on its usual host.